When animals act like humans or display hilarious tricks, it’s a different level of weird. Well, this is especially true for a micro pig and a dog with an unusual trick. Meet Frances Bacon. She’s a micro pig that has been banned from downing ale in a pub. “Why?” You might ask. She was accused of head-butting other patrons because alcohol made her a bit too excited. Frances Bacon lives in the inn. She’d go down the bar and minesweeps – drinking from glasses left or given by other customers – a few glasses. Then, when she’d had one too many drinks, she’d become aggressive. That’s why the poor micro pig was thrown out. The landlords love Ms. Frances a lot and would even take her on walks on a lead. This is the reason they have taken the responsibility to ban her from the bar to avoid hurting herself or any more customers. 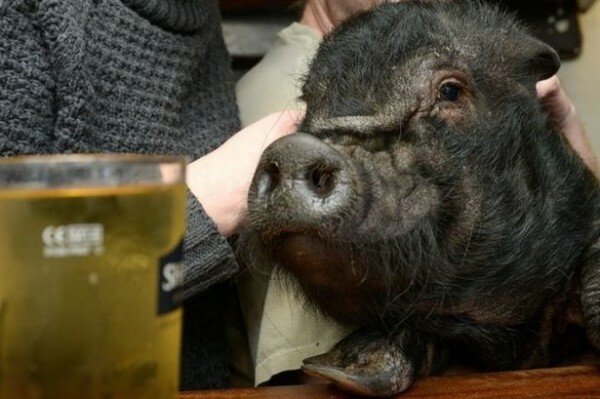 The innkeepers have also asked customers not to give the pig any beer or cider. They have also made sure she won’t be drinking any beverage left by customers. Smart dogs perform tricks like sitting, rolling over, jumping over things and playing dead. 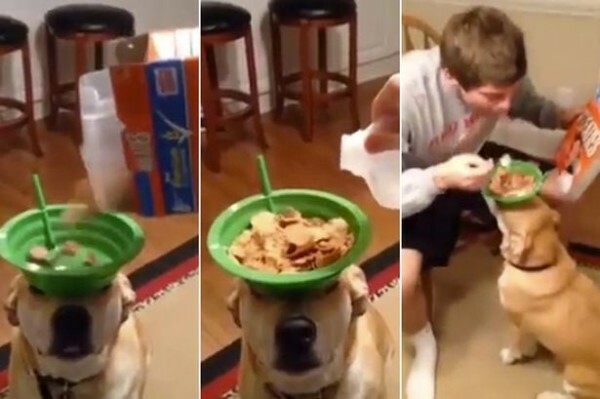 But have you seen a dog sit still while a bowl of cereal is balanced on top of his head? This hilarious four-legged friend seems confused as to whether he’s an inanimate object or a living thing. He sits perfectly still every morning to provide the perfect table service while his young master pours breakfast cereal and milk into the bowl. And despite food being a few inches away from its mouth, the loyal pooch never moves a muscle not only to allow the little boy enjoy his meal hands-free but also to avoid spilling anything on the carpet.